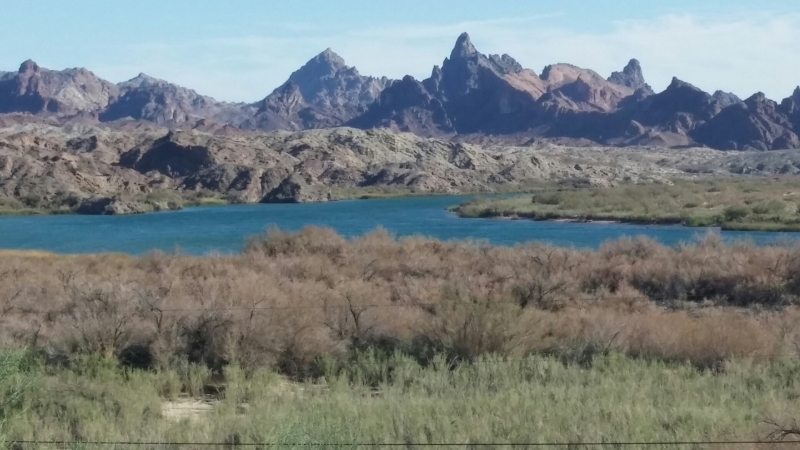 Our readers were introduced to Matt Chew in his guest post about the economic interests of ecological “restorations.” Dr. Chew is a faculty member of Arizona State University’s Center for Biology and Society and an instructor in the ASU School of Life Sciences. The rapid defoliation of tamarisk throughout the southwest, including California, is an immediate threat to the endangered Southwestern willow flycatcher, which long ago adapted to tamarisk in the absence of its native host, willow. The native willow requires a great deal more water than tamarisk. Therefore, willow died off when water throughout the southwest was diverted out of riparian corridors for human consumption and agricultural production. Dr. Chew is an expert on tamarisk and the role it plays in the ecosystems of the southwest and so we asked him to write another guest post for us on this topic. He has generously obliged with this detailed history of biocontrols and their use to eradicate non-native species. Evolution and natural selection are wild cards in attempts to eradicate non-native plants and animals. Although there are many dangerous consequences of using pesticides, the role that evolution plays in rendering pesticides useless is less understood and taken into consideration. Much like the hungry beetle that now is running rampant in the southwest, the weeds that are continuously sprayed with herbicide are also adapting and evolving defenses against the chemicals being used to eradicate them. There are now millions of acres of agricultural crop land infested by weeds that are immune to the pesticides that were sprayed on them for decades. Our pesticides are now useless on these “superweeds.” Instead of getting off the pesticide treadmill, we are developing stronger—and therefore more toxic—herbicides. Many of the plants being eradicated are providing food and habitat for animals. The animals that depend upon them are being harmed by their elimination. The methods used to eradicate non-native species often have unintended, negative consequences, such as breeding “superweeds” that cannot be eradicated. From California to Texas and occasionally beyond, tamarisks are among the most talked-about introduced plants in the US. Most of that discussion consists of familiar anti-alien dogma, augmented by the long-obsolete assertion that tamarisks are profligate water-guzzlers. Suffice for now to say that anti-tamarisk sentiment led to state and federal suppression policies beginning around 1940, and eventually to legislation at both levels. Little more than accumulated bad reputation of tamarisk and its presence in the region of interest led the US Fish and Wildlife Service to include tamarisks among the supposed threats to the persistence of the Southwestern Willow Flycatcher (Empidonax traillii extimus) when that subspecies was formally listed “endangered” in 1993. All of that meant both political will and appropriations were applied to the US Department of Agriculture’s search for biological control agents to deploy as “counter-pests” against tamarisks. By 1998 they had their critter, an Asian leaf-eating beetle that putatively specialized on tamarisks and would rather die than eat anything else. By that time, though, circumspection had set in, because especially in southern Arizona the endangered birds had taken to nesting in tamarisk stands. USDA promised USFWS that their armored foreign legion would not jeopardize flycatcher populations. USDA argued that the beetles they were about to propagate and release by the multi-millions were genetically incapable of surviving below 38° North latitude. In addition to famously dividing North from South Korea, that frontier runs from near the tip of Point Reyes through Stockton and Mono Lake; just south of Tonopah, Nevada; south of Canyonlands Nation Park; through Moffat and Swink, Colorado; on through the Garden City Kansas and increasingly irrelevant points east. Southern Arizona would surely never see a tamarisk leaf beetle. “Because SCIENCE!” Hold that thought. We can barely pause to consider the long and checkered history of biological control. Its inception required a few conditions, which may have arisen in different orders in different places. A sense of ownership, territorial claims or resource collection rights seems necessary, as does dissatisfaction with the dictates of fate. Why attempt to affect an outcome without expecting to benefit from the effort? A bit of empirical, practical natural history knowledge is also indispensable. Together they add up to the possibility of acting on the basis that “the enemy of my enemy is my friend,” to garner a greater share of whatever natural product seems desirable. Dogs to guard flocks and cats to discourage rodents are biological controls. The more organized and concentrated agriculture became, the greater the need for knowledge of “natural enemies” to enlist as economic allies. Even after revolutions in industrial chemistry offered alternatives, better living was still sometimes available through biology. With private property rights come boundary disputes, complaints about trespass and spillover effects of management decisions. Public property, especially where subject to intensive multiple use mandates, adds complexity and diversity (if not novelty) to the mix. Rights collide with powers and authorities. Politically compromised jurisdictions—like U.S. state authority over wildlife except where superseded by federal laws and treaties or licensed to private parties—are endless fodder for litigation and finger pointing. All the while, science reconstructs what is known or considered knowable, changing expectations, affecting policies and destabilizing political balances. Modern agricultural, horticultural and forestry practices are all legacies of the Renaissance, Reformation and Enlightenment motivations underpinning European colonialism. Empires were assembled and contested primarily for their economic advantages. During the past half-millennium they generated new wealth and new social classes that developed new governments. Among the array of actions those governments continue to undertake is facilitating the redistribution of valuable plants and animals. A visit to any retail food market reveals our near-total embrace of that redistribution. Almost every staple ingredient in every foodstuff is raised or grown far from its “wild” point of origin. Even insistent locavores prefer locally raised food, not locally evolved food. A negligible fraction of us recognize never-transported, never-domesticated edible organisms. Fewer still could survive on them as hunter-gatherers. Such are among the generally intended, hoped-for, positive outcomes of imperial colonialism. Famine is unnecessary, though it is a political tool, deployable as a weapon. Fish, meat and leather, plant and animal fibers, timber, pulp and derived products can still be wild harvested, but are mostly and increasingly farmed. Anything worth gathering is worth cultivating, from redwood trees to bison to sugarcane to minks to soybeans to insects, yeasts, and bacteria. Even aspirational exceptions like native plant gardening are actually impossible to accomplish: seed intentionally transported from one location to another has been biogeographically rerouted; plants sold by native plant nurseries are raised in multi-source, formulated soils in plastic pots. Even simply deciding to leave a plant where it was found can render it an artifact, and there may no longer be any wilderness so remote that the configuration of its biota remains uninfluenced by human agency. We are told that some of the consequences of all this redistributed and reconfigured biota are marginally negligible. Others are cutting into the profits. Some organisms are moved around unintentionally and unknowingly (zebra mussels, various “blight” fungi) often because unaware transportation technology designers and operators never prevented their distribution. Many intentionally abducted and marooned populations are behaving in unexpected ways, thriving without always accomplishing their intended purposes (alligator apples and cane toads in Australia; house sparrows and wild carrots in North America) or even significantly over-achieving (“Asian” carps and kudzu in North America; rhododendrons and grey squirrels in Britain). Even where post-colonial inclinations to recover and reinstate pre-colonial values are tolerated, they hardly withstand translation into economic choices. We are adeptly, fundamentally invested in moving things around. We are likewise invested in competition, and building coalitions and alliances to help us win competitions. Especially competitions we thoughtlessly or accidentally set in motion. As things turned out, USDA scientists were either mistaken or disingenuous regarding the latitudinal limits of their tamarisk leaf beetles. Likewise, even about the identity of the beetles, which is why I haven’t inflicted their Latin epithets on you yet. By 2010, sniping between USFWS and USDA, abetted by various conflicting conservation NGOs, led to a new “Biological Assessment” for the federally imposed tamarisk leaf beetle invasion. (I usually avoid using “invasion” in such circumstances, because invading exceeds many capacities of so-called “invasive species.” This was a real invasion, though, planned and carried out by people, not beetles. Beetles merely bred and spread.) One species of beetle became five, four which had been introduced: Diorhabda carinulata; D. elongata; D. sublineata; and D. carinata. Some were quite well-adapted to life in southern Arizona (31-32° N) and beyond. Furthermore, the endangered birds were also nesting in tamarisks in southern Utah, c. 37° N. USDA washed its hands of the federal program and revoked federal permits to release beetles; but that had no effect on the State of Colorado, which was heavily invested in producing them and continues to do so. Fast-forward to 2017. 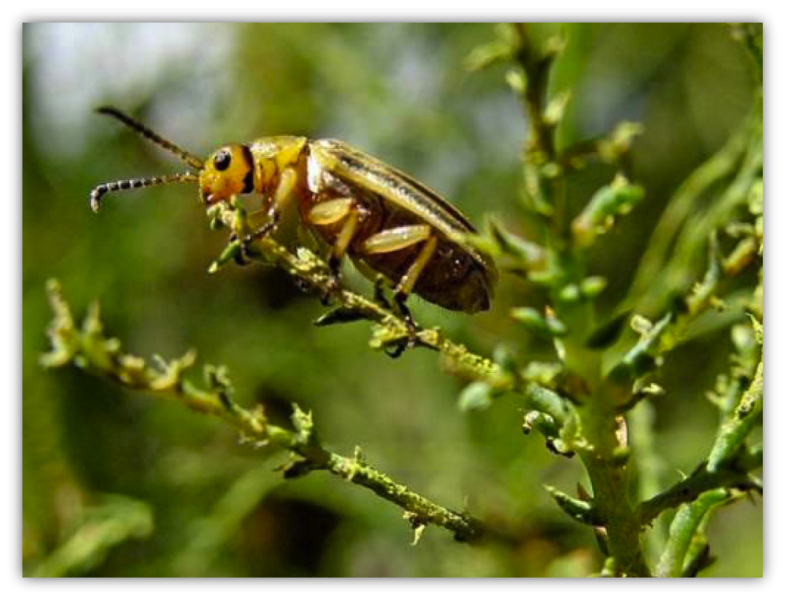 Tamarisk leaf beetles have been spreading along Arizona waterways at rates up to ten times faster than their most ardent cheerleaders imagined they could, and from multiple directions. They will arrive in almost every known Southwestern Willow Flycatcher nesting area sometime this year. By next spring those riparian thickets will be defoliated just at the point when the nestlings most require thermal cover (i.e., shade). Thanks to Reclamation-Era water diversion projects, attempts to re-vegetate those areas with willows will require constant gardening. Reclamation replaced willow habitat with tamarisk habitat. Nevertheless, the birds persisted. Beetle releases suppressed the tamarisks, but will almost certainly fail to eliminate them entirely. Beetles are just another evolutionary pressure on a tamarisk population that is already unlike any other in the world due to unforeseen hybridizing among several species. New tamarisks and new beetles are evolving. Maybe the beetles will try a bite of something else. They’re in California now; could they find something there? Maybe the birds will evolve to eat the beetles, although that hasn’t happened yet. 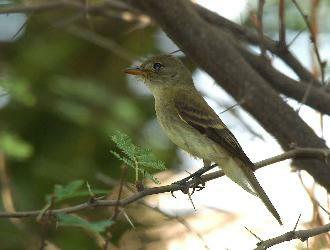 Perhaps the day will come when the Southwestern Willow Flycatcher gives way to the Tamarisk Beetlebird. It might not even take very long. But don’t bet on it. And don’t bet on biologists, bureaucrats or any other ambitious adults to re-learn the lesson of unintended consequences they laughed at as children, then (like so many other lessons) forgot. You are welcome to provide examples of successful biocontrols. I am not aware of any. In Hawaii, biocontrols resulted in the extinction of 15 native moth species. There are many other examples…rabbits, cane toads, etc. The significant reduction in water flow in the Colorado River basin (and others) is at the root of the problem. Native willow and cotton wood trees did not survive with substantially less water. The absence of trees on the river banks caused erosion, which caused another suite of environmental issues. Tamarisk was introduced to stabilize the banks because it was well adapted to the reduced water flow. None of the “restoration” projects that are destroying tamarisk are proposing to restore water flow. The water goes to metropolitan areas for drinking water and to irrigate agricultural crops (which is why they are relevant). No one proposes to deprive people of their drinking water or to quit growing food that is irrigated by water. Therefore, there is NO economic or environmental benefit in destroying tamarisk because it does not return the water that was diverted, which means the absence of tamarisk will not result in the return of native trees. Tamarisk is a scapegoat for the damage caused by human needs and activities. They are guiltless in this scenario. To blame them is to be confused about cause and effect. Step back. Look at the big picture rather than focusing on one plant without understanding why it is there and what functions it is performing. Brilliant response. Those responsible for many of the ecological disasters won’t actually try to fix them because it will mean loss of money for someone who counts more than the nature being harmed. Water misuse is leading to deserts across the earth. And killing trees is another part of the cause. Most people have no idea that this lake existed or the amounts of animals, including hundreds of thousands of migratory birds who used it. I’m always amazed at decisions some make that effect so many other people, animals, the environment, etc., with no accountability. I’m glad you read and enjoyed Hidden Life of Trees. I only recently started reading it when a friend loaned it to me, and it explains so much, including possible ways humans could help trees heal from infestations and Sudden Oak Death, (like for the cities, counties, various agencies, etc. to stop pruning, thinning, and cutting down trees.) I never realized that they need and want to touch each other and so can help heal each other. It changes everything that is “common” knowledge, just as learning about the harm nativism does. So thank you again for telling us about that amazing book. Really, every agency and human who deals with trees should have to read it. I’m horrified remembering how so many of us just believed we needed to prune trees for no real reason, and all the suffering to the trees that that causes. Using a pejorative word like “nativism” tells us that you are driven by religion, not science. I used to believe that trees should always be allowed to develop just as they wished, till I took a class from Leslie Buck (Cutting Back) on pruning. There are legitimate reasons for pruning in certain cases. In fact, trees “self-prune” when they approach a building or another tree. Or in the case of Eucalyptus, to prevent someone from getting killed by a falling tree planted in the wrong country by ignorant humans. The definition of nativism is a preference for native species (including humans) compared to non-native species (human immigrants or introduced plants and animals). The use of the word “nativism” is not associated with religious belief. In fact, it is an ideology that is more likely found among adherents to conservative religions to express their opposition to immigration. It is also a deeply held belief, comparable to religious belief in that regard. Most commonly reported genera : Quercus (23.4%), Pinus (17%), Eucalyptus (12.6%) and Cupressus (including Hesperocyparis)(8.7%). Next most commonly reported genera : Fraxinus (3.4%), Acacia (3.4%), Ulmus (3.2%), Liquidambar (2.5%), Pyrus (2.2%) Cedrus (2.1%), Sequoia (2.0%), Pseudotsuga (1.2%), Umbellularia (1.1%), Calocedrus (1.1%) and Prunus (1%). The remaining 85 reported genera are less than 1% each. Your belief that eucalyptus trees fail at a greater rate than native trees is not accurate and does not correspond to the public record. It is a symptom of nativism. As usual, you lied about what I said. I didn’t say Eucalyptus falls more often. But the CONSEQUENCES of a giant Eucalyptus falling are much worse than the consequences of any other tree in our parks – bay, oak, or pine.That is obvious from any of the trees that have fallen recently in CCRP. The public record does not substantiate your view that the “consequences” of falling eucalyptus trees are greater than other tree species. Here is a news report on the most recent “death-by-tree” in San Francisco: http://www.sfgate.com/bayarea/article/Woman-dies-hit-by-tree-limb-at-Stern-Grove-3287785.php Kathleen Bolton was killed by a big redwood branch in the parking lot of Stern Grove. A certified arborist had identified that tree branch as being hazardous 5 years earlier. The dangerous limb was created by topping the tree. Tree topping is an example of a pruning practice that both damages the tree and makes them hazardous. There is nothing more consequential than being killed. That’s enough of your accusations about lying. Your beliefs about eucalyptus are not accurate. That doesn’t make me a liar. We’re done here. Million Trees is not obligated to provide a platform for your accusations. Perhaps I apply the terminology “strawman argument” somewhat incorrectly, but the argument has an underlying posit that it was OK to have deprived ecosystems of water and divert it long distances to support human living in ways that facilitated humans to live in numbers beyond the human carrying capacity of the planet. I DO say it was never OK to have done that, and it is still not OK to do so. You obviously recognize that the proliferation of Tamarisk was a response of the webs of life to ecosystem damage by humans. I would like to think that the wording you chose was simply a short-cut with unintended consequences. Because the damage was not caused by human “needs”, it was caused by human ignorance that they can live outside the constraints of nature. In addition, they think they are clever enough to succeed at the the game of serially swallowing. We swallowed a fly, nature swallowed a spider to catch it, we swallowed a bird to try to catch the spider. You object to the choice of the bird, but this example is but one demonstration of how human choices of what to swallow, even if made using the best science and.or intuition and/or available tools at the time can easily be in error. It is not the choice of tool that is the problem, it is the response model itself. We all know how the There Was an Old lady song ends. Thanks. That’s a good point. You were correct to assume that I did not mean to imply that the diversion of water to serve human needs was a moral choice. Clearly it was not. It was an expedient choice, as are most choices of humans. I was trying to say that for the same reason that humans chose to divert the water, they are unlikely to choose to reverse that decision. I was also saying that those who claim to be “restoring” the ecosystem aren’t trying to reverse that decision either, which makes them complicit in the destruction of the ecosystem. As for the original decision, let me say this. If the legal process of evaluating environmental impacts were actually functional (and had been operational at the time the water was diverted), the impact of diverting the water on ecosystems would have been better understood. However, we can’t assume that another decision would have been made if that outcome had been understood. The review was likely to have concluded that environmental impacts would be “significant, but unavoidable.” Then, there might have been mandated “mitigation” which would throw money at some totally unrelated “restoration” project that has nothing to do with the problems created by the project being evaluated. I suspect you have as much experience with environmental impact reviews as I have and that you therefore understand that they justify whatever outcome the buyer of the review wants. They are an elaborate paper exercise, in my experience, with no ultimate benefit to the environment. The industry of consultants that produces these reviews and the lawyers who defend and challenge them are the only beneficiaries of this charade. Why do you censor comments? It only proves that you have something to hide (i.e., the truth!)? I do not post comments that consist only of name-calling, threats, accusations or are repetitive. When your comments contain any information–which they rarely do–I post them. As you can see from Patty Cotterill’s comment, I often post comments that are both critical and substantive. Just wanted to add that, as you said, pruning trees can both be necessary and also harmful, since it depends on each tree and situation. I’d learned the hard way, by making irreparable mistakes with pruning many years ago, which was based on being taught that certain trees need pruning. I think too many people have accepted this ideology without understanding the consequences or finding out the truth. New gardeners next door destroyed a small beautiful manzanita, leaving it with cut off branches for no apparent reason. It’s slowly dying and the stubs are horrible to see. Too many people have no idea what they are doing, but just believe that “gardening” means maiming and killing plants. A friend new to California planted a line of redwoods to be a privacy screen from neighbors, but for some reason believed they needed pruning, which was a disaster because she lost the privacy she was hoping for by cutting off the lower branches, and the trees started suffering. They were in particularly hot area in Sonoma county, so each lost branch made the trees more vulnerable to heat damage. I’ve noticed that redwoods do best when with others (like described in that wonderful book, The Hidden Life of Trees), which I thought was for the increased moisture, but now realize for the company of other trees as well. Thank you for that list of which tree species are most vulnerable to failure. We keep learning….